It’s all over the media and Facebook — “Anti-vaxxers are bringing back disease!” As soon as any child gets a “vaccine preventable” illness, an unvaccinated child is immediately blamed. Even if no one has any idea where the child got the illness, and no unvaccinated children in the area are known to be sick. This leads to angry, viral social media posts, and not-so-respectful chiding from mainstream media to “get vaccinated!” All those darn anti-vaxxers…bringing back long-eradicated, scary disease! But…is this what’s really happening? Or are anti-vaxxers just a scapegoat for failing vaccines? The other day, I ran across a very interesting set of data, courtesy of Blue Cross Blue Shield. It shed some light on this oh-so-controversial topic. So, are vaccine rates falling? Are fewer people vaccinating today than 5 or 10 years ago? Here’s what’s really happening. A greater number of people are opting out on purpose. The number of parents who said they are refusing to vaccinate rose from 2.5% in 2010 to 4.2% in 2013 (and I assume it is continuing to rise). However, the overall vaccine coverage rates are rising. That’s because the greatest reason why parents don’t vaccinate is because they miss appointments. Maybe they don’t have health insurance, or don’t have access to care, or can’t take time off work to take their children to the doctor. These are parents who would vaccinate, if they could. When we look at the data as a whole, 69% of all children completed the CDC schedule by age 3 (of those born in 2010), and 77% completed it (of those born in 2013). That’s an 11% increase in vaccination rates in just three years. The documented reason for “under-vaccination” (people who have done some, but not all, vaccines) was missed appointments 62% of the time, and purposely avoiding particular vaccines just 6% of the time. Completion rates for vaccines individually ranged from 82% – 91%, and again, these numbers were higher in the 2013 birth cohort vs. the 2010 birth cohort. Now, if we try to look even further back…what do we find? Essentially, in the last 10 years, full-coverage rates have almost doubled. Most families are vaccinating. And among the families who want to vaccinate but have struggled to have access, for whatever reason, more of them are vaccinating today than ever. The families that aren’t vaccinating due to missing appointments is a much larger pool than the families who are not vaccinating due to conscious choice. If a group of people is responsible for “bringing disease back,” it’s extremely unlikely to be the conscious objectors. However, since overall coverage rates are rising, it’s very unlikely that “lower vaccine coverage” has anything to do with it at all. Let’s take a look at that idea. Many of the recent mumps outbreaks occurred on college campuses, and most of the people were fully vaccinated. The CDC even notes that vaccine failure was a major reason for the mumps outbreaks (source). The majority of people with pertussis had been partially or fully vaccinated against it. (50% vaccinated; 40% unknown; 10% unvaccinated.) (source) Some studies show that this is because vaccinated people can be asymptomatic carriers (source, source, source). Essentially…the majority of outbreaks (but not all) cannot be tied to unvaccinated communities. It did happen with a couple of the measles outbreaks, but primarily — that’s not what’s happening. Do We Just Need More Vaccines?! The more we vaccinate, the more disease is running around. So we could blame rising disease rates on vaccinating more. Or, we could say that vaccines just aren’t working. But we certainly cannot say that “lack of vaccination” is causing it. There’s absolutely no high-quality evidence to suggest that that is true. There’s a lot more than that, but this topic isn’t what the post is about. I’ll expand on some of these in future posts. Essentially? This is not a black and white topic. We absolutely cannot conclude, from the data at hand, the vaccines are unilaterally good, and that lack of vaccines is what’s bringing diseases back. All of the inflammatory statements about “anti-vaxxers” are just that — inflammatory, untrue statements. These are propaganda-laden pieces, intended to scare parents into compliance at any cost. They don’t give the full picture of what’s happening in the US (on purpose), and they seek to violate informed consent, particularly when coming from medical professionals. Next time you hear “It’s all because of anti-vaxxers!” pull out the data, and set them straight! 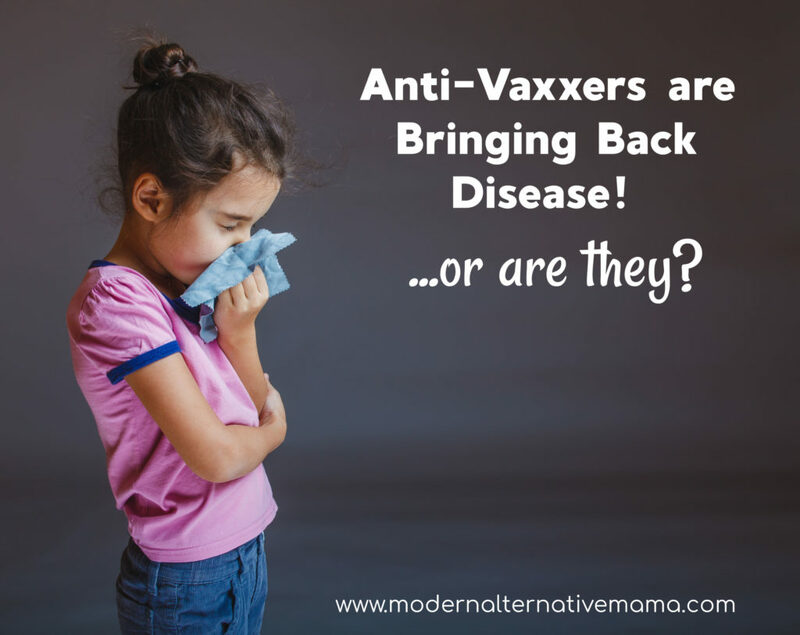 Do you think anti-vaxxers are bringing back disease? The issue is less about the efficacy of vaccines, and more about the fact that new parents are being scared into viewing that efficacy unilaterally. Parents on both sides of the debate (pro and anti-vaxxers). We have a known history in this country of over prescribing (see Superbugs: https://www.mayoclinic.org/diseases-conditions/infectious-diseases/expert-answers/superbugs/faq-20129283 ) and it would hold with our history that we also over-vaccinate out of fear and lack of knowledge. However, that doesn’t necessary mean that ALL vaccines are bad and that is whats happening. Parents keep choose ALL or NOTHING, which is terrifying. Last, its important to remember when looking at outbreaks that if the spread is severely limited due to a vaccinated population, the vaccine has done its job. They aren’t 100% effective (nothing, ever, medically is 100% effective). Their job is to attempt to prevent outbreaks, and when that fails ensure the majority of the population is mostly immune to prevent the outbreak from becoming an epidemic. I really like posts like yours that show parents the need to look at each vaccine separately and determine if that one in particular is worth it. I basically agree, but i have a couple more thoughts. Some parents might deliberately miss appointments if they don’t want vaccines. Also, a child who is today considered partially vaccinated might have been considered fully vaccinated in the past (when there were fewer recommended vaccines). So regardless of the percent of fully vaccinated children, there are definitely way more vaccines today. Your source only covers commercially insured children. It says so in the first paragraph. It does not cover anyone on the ACA, Medicaid, or other government assisted or run programs. In other words your source covers only part of the population. Also, did you just stumble across this info or did you find it while searching for some science like your Facebook post stated. Because it sounds like you went searching for something to support your bias. Except, this doesn’t support your bias and you either failed to realize this or chose to ignore this. You evidently missed the second source, which says about the same thing: https://www.cdc.gov/nchs/data/hus/2017/066.pdf This data covers ALL kids under 35 months of age. It seems you were more interested in your own bias than reading carefully. Do you have other numbers or another explanation you would like to share, with the facts and citations to back you up? No I didn’t miss that second source. Please explain to me what the MSA was for these figures? Hib (full series) is up. Chicken pox is up but that vaccine has only existed for about the length of time covered in this data so it only had one way to go really. Rotavirus is up but again, numbers are still low. What is MSA and and VPD? Whether you think vaccines are beneficial or not, you should definitely be against the government forcing injections on your children. Its an abominable violation of our rights as a human being. I would think people would have learned by now that you CAN NOT trust a government. I totally agree Natalie. I personally chose not to vaccinate my 3 year old so far, but I don’t think people that do vaccinate are bad. It’s when they blame the anti-vaxxers for illness and use that herd immunity excuse and say scary things like the government needs to force vaccinations that I start feeling heated on it. We can’t call ourselves a free country if that’s the case. The government dictating what’s injected into our bodies scares me way more than any disease ever could.